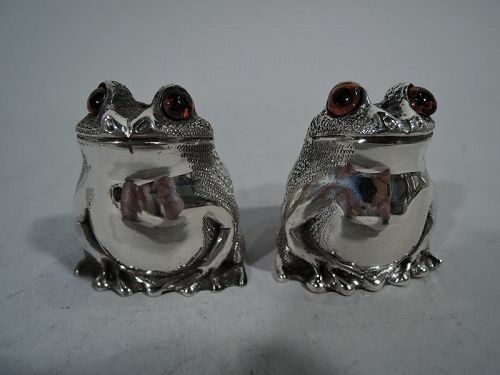 Pair of English sterling silver figural salt & pepper shakers. Each: A squatting reptile with legs gathered close to body. Scaly back, smooth front, and intense glass exophthalmic eyes. Closed mouth set in smirking smile. One has plastic plug; the other has cork plug. London 1967 hallmarks: One made by Richard Comyns; the other by Asprey. Fine condition. 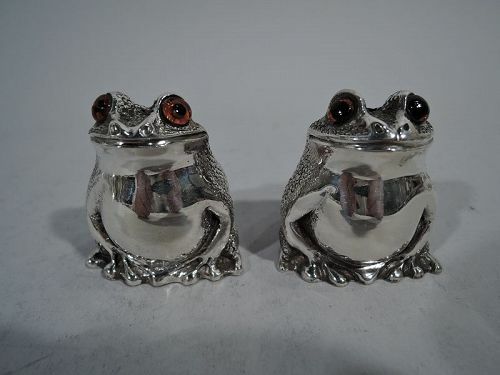 Pair of English sterling silver figural salt & pepper shakers. Each: A squatting reptile with legs gathered close to body. Scaly back, smooth front, and intense glass exophthalmic eyes. Closed mouth set in smirking smile. Plastic plug. London hallmarks: One made by Richard Comyns in 1971; the other by Asprey in 1967. Fine condition. 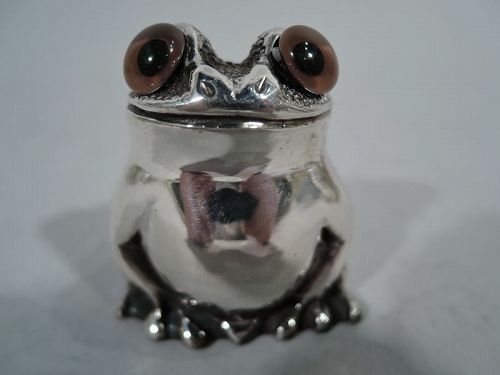 George VI sterling silver frog shaker. 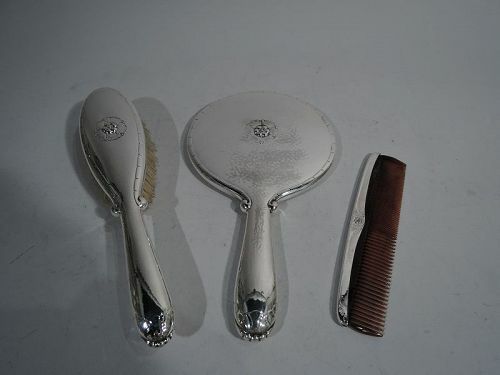 Made by Asprey in London in 1947. A squatting reptile with legs gathered close to body. Scaly back, smooth front, and intense glass exophthalmic eyes. Closed mouth set in smirking smile. A cute solo companion. Plastic plug. Hallmarked. Fine condition and patina. 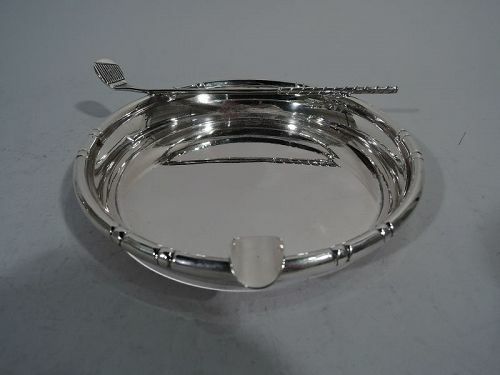 Large sterling silver ashtray in Bamboo pattern. Made by Baldwin & Miller in Newark, ca 1950. Shallow bowl with notched rim and applied golf club. Single cigarette cradle. A fun novelty from the tobacco-friendly midcentury. Hallmark includes pattern no. 13600. Very good condition. 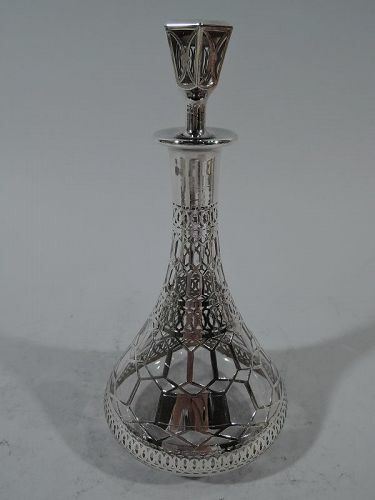 Art Deco clear glass decanter with silver overlay. Conical bowl, cylindrical neck, and flat everted rim. Stopper tapering and hexagonal with short plug. Interlaced geometric ornament with circles and hexagons. Vacant rectangular frame. Also vacant is stopper top. Hallmarked. Very good condition. 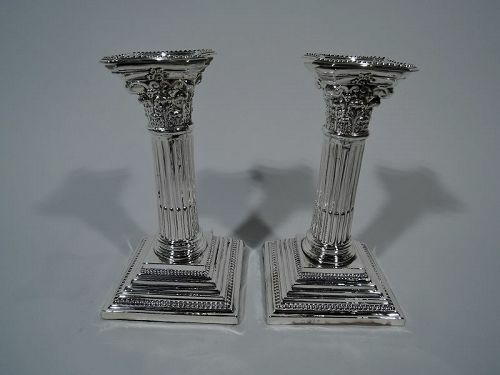 Pair of Edwardian sterling silver candlesticks. Made by George Nathan & Ridley Hayes in Chester in 1904. Column with stop fluting mounted to stepped square base with gadrooned rim. Composite capital with detachable bobeche. Felt-lined underside. Hallmarked. Very good condition with only a few minor pings, principally on base rim. 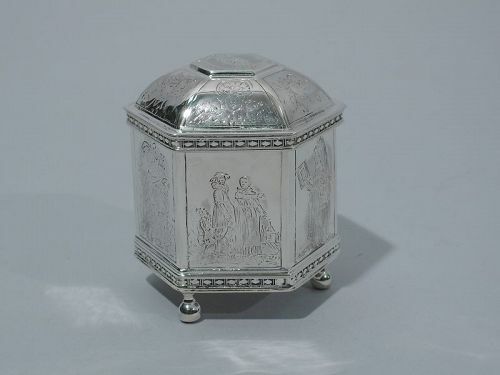 Small sterling silver casket. Hexagonal with raised cover and 3 ball supports. Retailed by Metropolitan Museum of Art in New York, ca 1985. Engraved olden-days scenes with figures in gowns, breeches, and neck ruffs. A sweet keepsake box with a nice period feel. Hallmarked. Good condition with some rubbing. 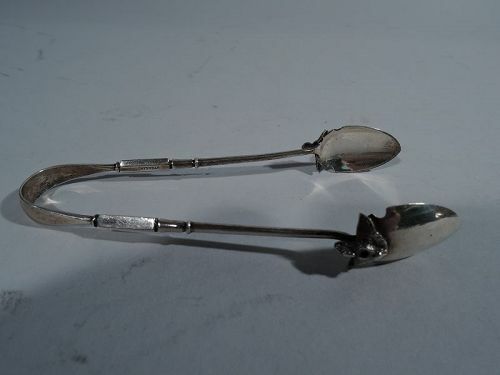 Egyptian-Revival sterling silver sugar tongs in Isis pattern. Made by Gorham in Providence. U-form with ovoid jaws. Applied to jaws are coiled serpents and wings. Engraved script monogram. 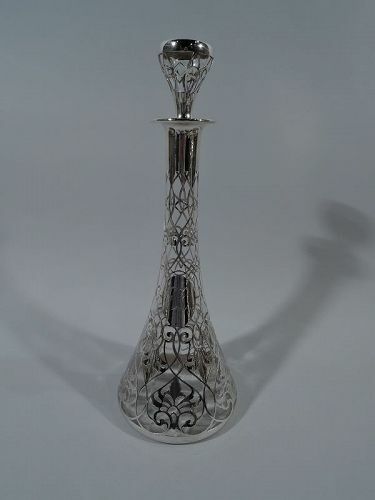 A desirable piece in this pattern, which was first produced in 1870. Hallmark from last quarter of 19th century. Very good condition with taut spring. 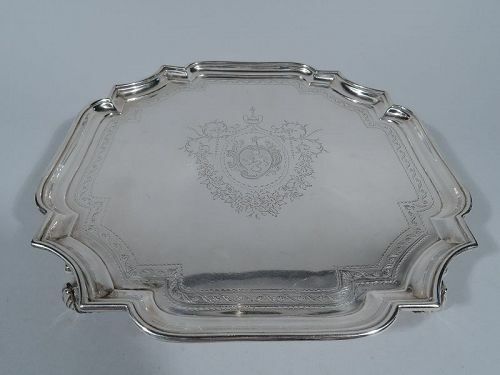 George II sterling silver salver. Made by John Tuite in London in 1727. Four-sided cartouche with concave corners and molded rim. Four leaf-capped volute scroll supports. Well has engraved central armorial with amphora and garland as well as ornamental border. Hallmarked. Very good condition and patina. 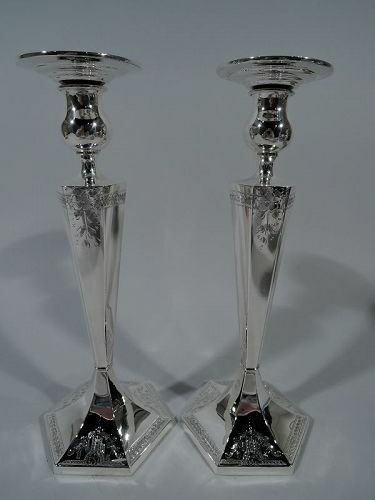 Pair of American Edwardian sterling silver candlesticks. Each: Tapering and faceted hexagonal shaft, raised hexagonal foot, and bulbous socket with wide and stepped detachable bobeche. Engraved stylized ornament: Leaves and flowers and imbricated leaf bands with pointille borders. Hallmarked “sterling” with no. 5775. Nice form and patina.